2022: 11,000 first-year students in high-tech tracks in universities and colleges. 2011: Only 5,700 first-year students in high-tech tracks in universities and colleges. The PBC updated the multi-year forecast based on reports from the institutions and their preparations for student admissions in the upcoming years. In preparation for the start of registration for the 2020 academic year: The Council for Higher Education (CHE) is updating the multi-year forecast (2011-2022) for admission of first-year students in all of the high-tech tracks in academic institutions (universities and colleges). The data show that the number of students is expected to double within a decade, from a mere 5,693 students, in 2011, to 11,059 students in 2022. • The data show that in 2022, the field of high-tech studies is expected to be among the most pursued courses of study that are studied in Israel. 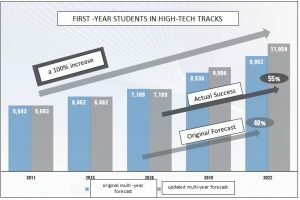 Within the multi-year plan for the enhancement of high-tech professions, 2016 was defined as the base year, and the original forecast for 2022 presented an expected increase of 40% in the number of students (9,952 students) entering high-tech tracks in universities and colleges (See graph). Nevertheless, in light of the program’s success, and the reports of the institutions that they intend to increase the rates of student admissions, the PBC has updated the multi-year forecast (a 55% increase), pursuant to which, in 2022, 11,059 first-years students will study in high-tech tracks in Israel. High-tech courses include, inter alia, the following majors: electrical engineering and electronics, software engineering, information systems, computer sciences and data science. The data are based on the reports of the institutions and their preparations for student admissions.